I did not write this post title lightly. 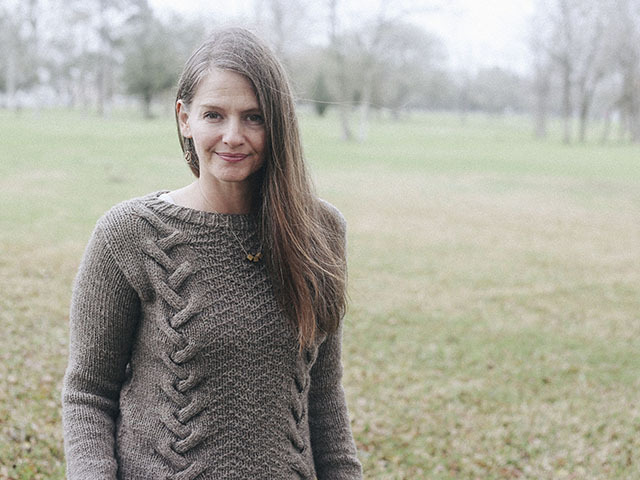 I say this knowing that, according to Ravelry, I have knit 68 sweaters, many of which I loved. I say that knowing I still have tons of really great patterns to work through this year. 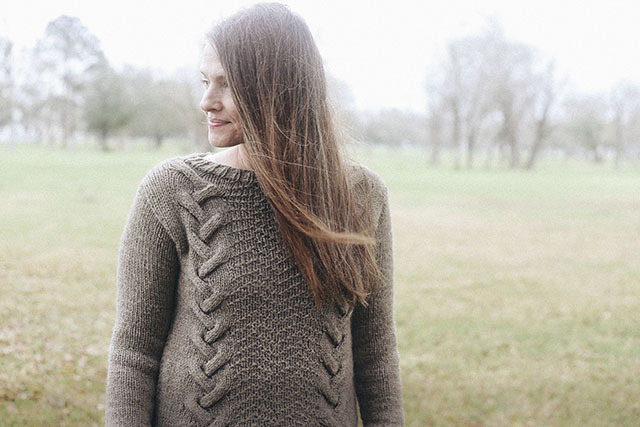 But for now, if I consider both product and process, this is my favorite sweater pattern to have knit. Guess why? Giant. Bulky. Cables. Did I have you at cables or bulky, or maybe giant? If you removed one, or even two, of those factors, I'd still probably have wanted to knit this. But with all three together, I couldn't resist. When Alina asked if I'd like to test knit, I knew I'd be going away and have to rush it, but I could not resist. Actually, it worked up so quickly, I had the body and a sleeve knit before I left. When I got back, I dealt with a migraine for three days but still finished it by the release day, which is today Feb 25th. I wish I'd been a better tester and had it done earlier, but I just can't regret getting to knit this. It was my favorite. Like I said, it is out now, so you can totally get this pattern today. 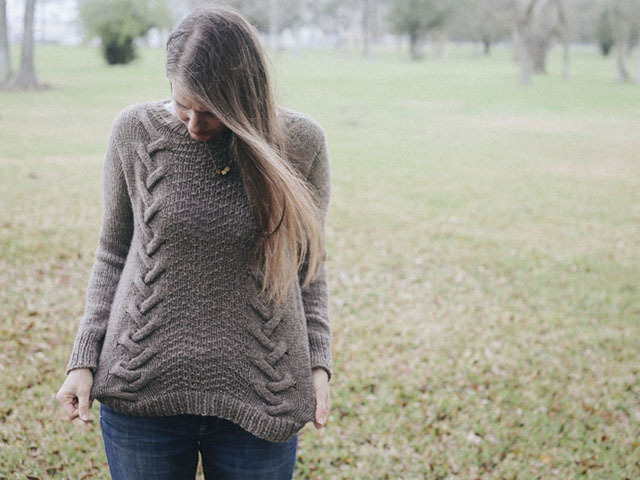 And you owe it to yourself to knit something so completely fun. Even the sleeves were interesting because of the chevron stitch Alina added to the elbows. And bulky. Bulky, people. It knits itself through a few episodes of Dark. This is a big part of the allure. 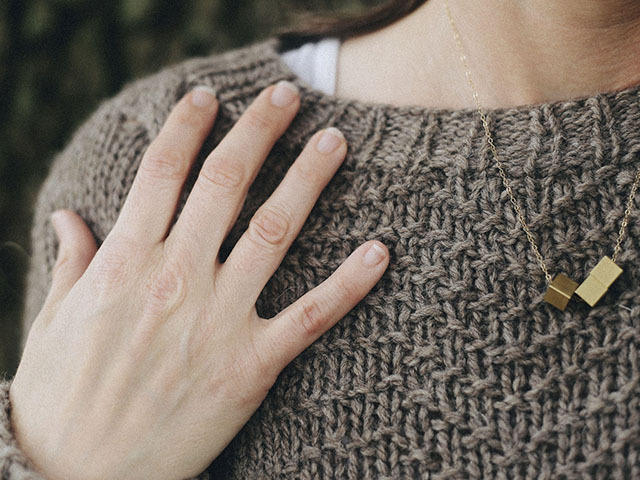 I've shared before that bulky knits on wooden needles put me in a happy, nostalgic frame of mind. It is the solution to peace through many difficult situations I face. For all I know, it could be the solution to world peace- picture Middle East Peace KALs. Now, I'll tell you that I wish I'd knit a size up. 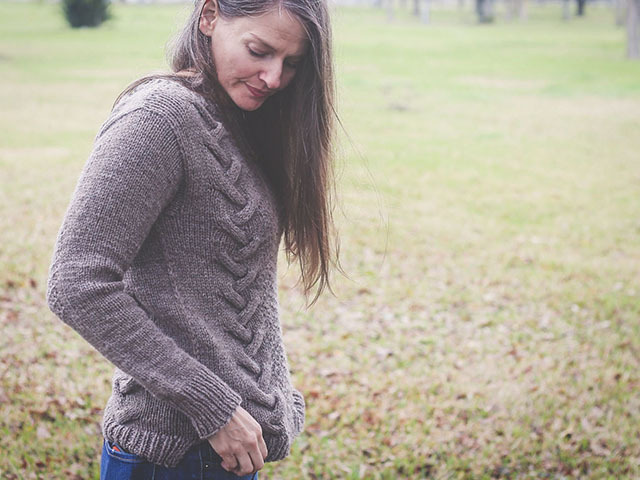 I knit the 41" bust and did block it out to that measurement, but when I put it on, the Cascade Eco tends to lengthen and I lose some of the boxy look that I love so much on Alina's version. Maybe that's a fiber issue, but I've also decided that while my broad shoulders didn't affect sizing so much several years ago, they do now that I'm carrying extra weight in my upper arms. My chest measurements would lead me to choose the size 41", but I think more width in the shoulders would have given me the full modified drop-shoulder effect. I'm thinking this is why every time I go to knit an extremely oversized sweater, I tend to end up with just mildly oversized. There's definitely a place in my wardrobe for mildly oversized too, so it's all good. 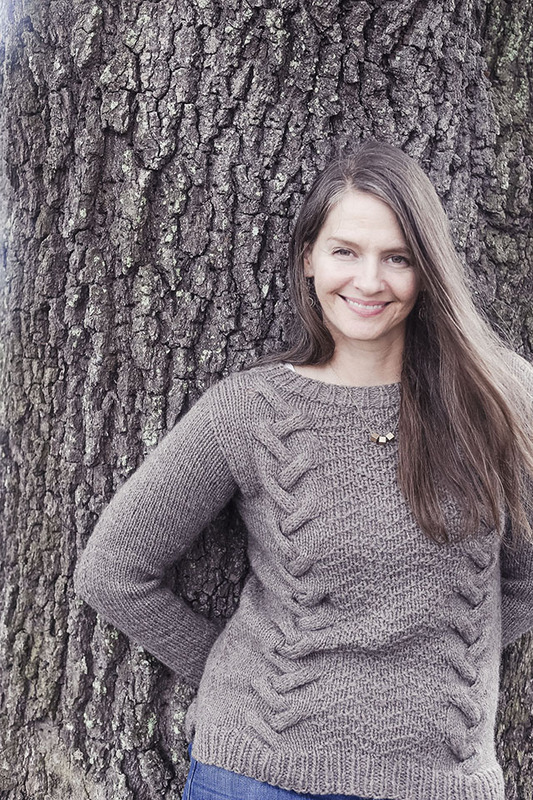 I feel great about this sweater and I did have just enough Eco to knit the size small. I wouldn't have had enough for a medium. 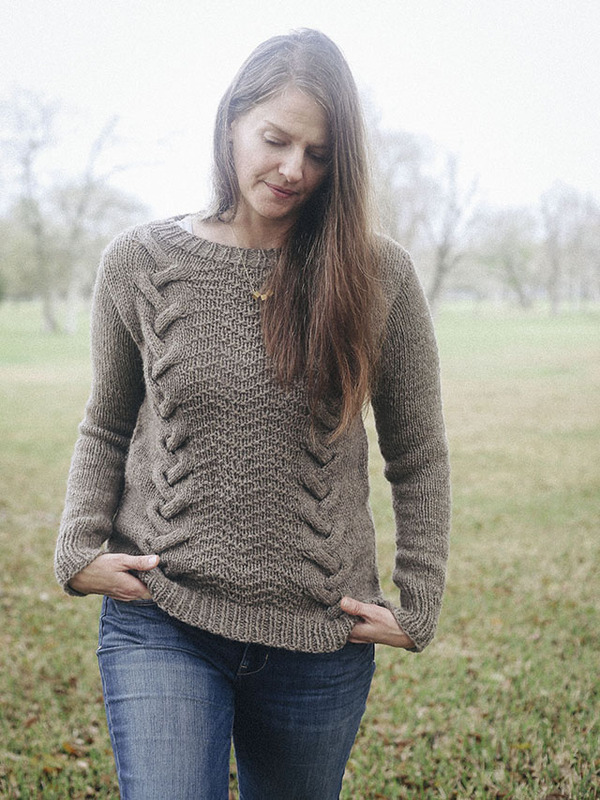 I'm also feeling empowered by having figured out what I need to look for on schematics when choosing my size in sweaters and how I might be able to modify patterns for a better fit in the future. I usually add to the depth of the armhole, but I need to keep the broadness of my shoulders in mind too. 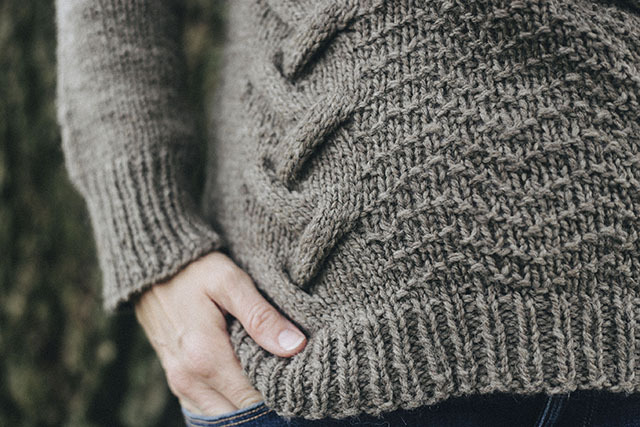 Details: I knit the second size (small) with Cascade Eco and US size 6 and 7 needles. It took only two skeins of Eco. Two skeins!! 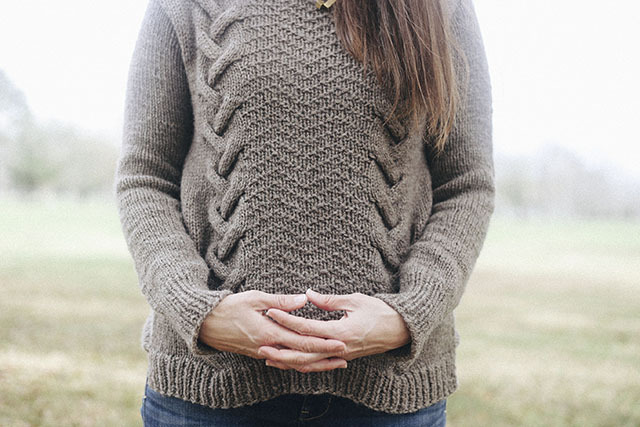 When they are on sale for $11 each, that's not a bad deal for an intricate-looking hand knit. Modifications: I added 6 stitches to each sleeve, as I often do to handle the disproportionate measurements of my chest and upper arm. (What can I say- I'm ripped) As I said earlier, after knitting this, I think I should start knitting a size up due to the arms and the whole broad shoulder thing. I love this as is!! It feels comfortable and casual. Please, please let us have some more cold weather so I can enjoy it without a sweaty upper lip! As much as I love it, I want one in a size medium, immediately!! I think I'd love all that extra billowy cabledy goodness, even if it did swallow me up. Another blog post on this sweater is here. And I mention it in podcast episodes: Doing it with Ease and First Knits.